Mr Cook said he was not over-concerned by the dip in handset sales, adding that the 1.3 billion active Apple devices around the world provided a strong customer base for the firm’s services businesses, which include Apple Pay. Analyst Carolina Milanesi, of California-based Creative Strategies, tweeted that “1.3 billion users most of whom are extremely engaged with their devices is why the services numbers will be more and more interesting going forward”. 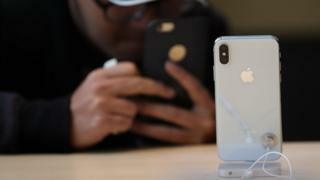 Apple has been under a cloud after revealing that it deliberately slowed batteries in older phones, prompting investigations in several countries. It has since apologised, offering customers cheaper batteries and other modifications, though analysts have said that could reduce replacement purchases, potentially affecting the firm’s bottom line. Jeff Fieldhack, research director at technology consultancy Counterpoint, said while Apple’s opening quarter was “fantastic” for its new devices, it may struggle to keep sales levels up. “Because of the higher prices, it will be a challenge to keep those volumes going,” Mr Fieldhack said. He added the firm’s performance in China, India and other emerging markets would also be crucial to future growth. Apple has struggled to lure customers away from several rivals in China, the world’s largest smartphone market, as it competes against more affordable devices. It faces similar challenges in India, where the firm currently has just 2% market share . Growing its Indian customer base will be important for future sales, Mr Fieldhack said.